Join Organic Consumers Associations campaign to mobilize one million consumers to end Monsanto’s Global Corporate Terrorism. Percy Schmeiser is a farmer from Saskatchewan Canada, whose Canola fields were contaminated with Monsanto’s genetically engineered Round-Up Ready Canola by pollen from a nearby farm. Monsanto says it doesn’t matter how the contamination took place, and is therefore demanding Schmeiser pay their Technology Fee (the fee farmers must pay to grow Monsanto’s genetically engineered products). According to Schmeiser, “I never had anything to do with Monsanto, outside of buying chemicals. I never signed a contract. Rodney Nelson’s family farm is being forced into a similar lawsuit by Monsanto. Support Schmeiser, Nelson and hundreds of other farmers who are being forced to pay Monsanto to have their fields contaminated by genetically modified organisms. 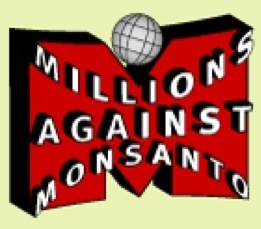 Sign OCA’s “Millions Against Monsanto” petition. These petitions will be physically delivered to Monsanto and related court hearings. Monsanto, the number one producer of the rBGH synthetic steroid, sued Oakhurst, claiming they should not have the right to inform their customers that their dairy products do not contain the Monsanto chemical. Given the intense pressure from the transnational corporation, Oakhurst was forced to settle out of court, leaving many other dairies vulnerable to similar attacks from Monsanto. Anniston, Alabama CitizensANNISTON, Ala. — On the west side of Anniston, the poor side of Anniston, the people grew berries in their gardens, raised hogs in their back yards, caught bass in the murky streams where their children swam and played and were baptized. They didn’t know their dirt and yards and bass and kids — along with the acrid air they breathed — were all contaminated with toxic chemicals. They didn’t know they lived in one of the most polluted patches of America. The negative health effects, due to exposure to Monsanto’s Agent Orange, have been well documented over the past three decades. The dioxin in Agent Orange has been accepted internationally as one of the most toxic chemicals on the planet, causing everything from severe birth defects, to cancer, to neurological disorders, to death. But Monsanto has successfully blocked any major movement towards compensating veterans and civilians who were exposed to the company’s Agent Orange. Long before Agent Orange was used as a herbicide in the Vietnam war, Monsanto knew of its negative health impacts on humans. Since then, Monsanto has been unsuccessful at covering its tracks and has even been convicted of fabricating false research documentation that claims Agent Orange has no negative health effects, other than a possible skin rash. Thanks to Monsanto’s influence, the Center for Disease Control also released a report claiming veterans were never exposed to harmful levels of Agent Orange. Agent Orange VictimAs a note, from 1962 to 1970, the US military sprayed 72 million liters of herbicides, mostly Agent Orange, on over one million Vietnamese civilians and over 100,000 U.S. troops. As a result, within ten years of the close of the war, 9170 veterans had filed claims for disabilities caused by Agent Orange. The VA denied compensation to 7709, saying that a facial rash was the only disease associated with exposure. Monsanto has also been implicated in the indiscriminate sale and use of RoundUp Ultra in the anti-drug fumigation efforts of Plan Colombia. Of the some $1.3 billion of taxpayers’ money earmarked for Plan Colombia, Monsanto has received upwards of $25 million for providing RoundUp Ultra. Damaged Banana CropsRoundUp Ultra is a highly concentrated version of Monsanto’s glyphosate herbicide, with additional surfactants to increases its lethality. Local communities and human rights organizations charge that Ultra is destroying food crops, water sources and protected areas in the Andes, primarily Colombia. Paradoxically, the use of RoundUp Ultra has actually increased coca cultivation in the Andes. As local farming communities are increasingly impacted by RoundUp Ultra fumigations, many turn to the drug trade as a means of economic survival. Regional NGOs have estimated that almost 200,000 hectares have been fumigated with Ultra under Plan Colombia. Monsanto also produces the most commonly used broadleaf pesticide in the world, glyphosate–or Roundup. In addition to its inherent toxicity as a chemical pesticide, Roundup has now been found to aid the spread of fusarium head blight in wheat. This disease creates a toxin in the infected wheat, making the crop unsuitable for human or animal consumption. Canada’s wheat industry is currently being ravaged by this disease. At the same time, the widespread use of Roundup has resulted in the formation of “super weeds” — unwanted plants that have developed an immunity to these pesticides. Read study linking Monsanto’s Roundup to Cancer. There are a lot of great action alerts on the page to sign as well.